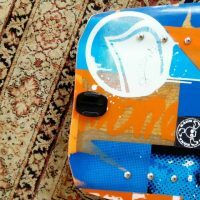 This is a wakeboard for pros and for beginner riders, the board is designed for boat riding and its designed for cable wakeboarding too so this means the bottom of the board is indistructable !!!!!! the board is in great conditions and ready to be used. the board size is 138cm and the boots (shose) size is 44~46. with the board you get a FREE PRO LIFEJACKET or a FREE WETSUIT !!!!!!!!!!! This Ad has been viewed 325 times and got 2 replies.